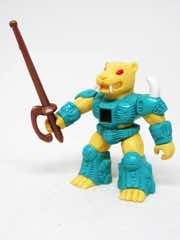 Of all the toys I expected to see remade in 2017, Sabre Sword Tiger was not one of them. Hasbro put one out in Transformers as "Fengul," a Titan Master companion to Grotusque. It's the second Battle Beasts head companion figure we've seen so far, and this was as good of a time as any to look at its inspiration from thousands of years ago, back in the 1980s.